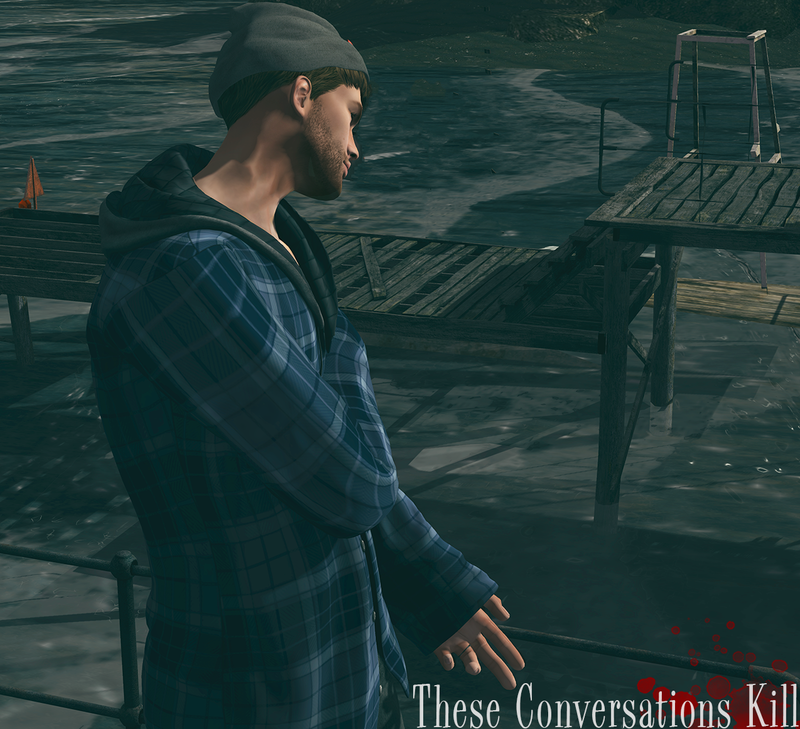 Whenever I come across a Fisherman’s beanie (whether it be one with or without hair included) I feel that my scenes should have something to do with water and boats and or both. So after I received the Kenny hair from Modulus my first thought would be to find a location with those things in mind. Fortunate enough for me as I was looking at one of my resources for locations to potentially take photos at I instantly saw Erebos Harbor and I took a cab there. Shortly after I started to explore and walk around, I found the perfect location. There was a dock with several boats and a great view of the ocean and that to me felt like a winner. After getting set up and getting everything just right (in my eyes anyway) I went to work and from that this photo came to pass. Lighting is something I struggle with at times and half of the time getting things to look how I think they should (or want them to). With this pic I do feel like all the conditions were right and I was satisfied with the outcome and I do hope it shows to anyone taking a look as well. At the beginning of the post I mentioned the Kenny hair by Modulus, which is available right now at Shiny Shabby (openened on the 20th). It’s a well made fisherman’s beanie with a fringe of hair coming out of the front and a little bit on the sides. I’ve been going with brown hair lately mainly because mine is that color in the real world. The hair comes in 5 color packs each with an integrated tinting HUD which also serves to help change the fabric color of the beanie (6 different shades). Recently I’ve just been posting one primary picture on the blog and not doing more than one but because I enjoyed the scenery around me at Erebos Harbor, I thought I would capture myself from another angle and get more of the water, and with the type of ambience I had really just gave me that feeling that I made the right choice by deciding to come here. You’ll also notice that I’m wearing the Fugitive Flannel from Razor that I picked up while I was browsing The Clique event when I was there. Actually there were a few things I grabbed but whether I get around to blogging them while the event is running is yet to be seen. A lot of irons in the fire going on right now and I definitely do not want to burn myself out or not think of it as being fun. That is one of the sure signs and death knell’s of a blogger. A few more details about the Flannel are that it comes fitted for Belleza male bodies but also has fits for several women’s bodies and it is made so that it is loose fitting to avoid anything poking through that might do so. I am wearing the blue version but it also comes in both black and yellow just in case blue is not a color you tend to wear a lot. I wear a lot of things that are usually black so it was down to blue or yellow for me and while yellow would have been fun, I think when the idea for this photo was formulating blue was the best choice. Recently I found out that myself and 19 others (Lucky was also included in the 20 woohoo) were selected as the official bloggers for Pose Fair for 2018. I couldn’t be more excited as I’ve been going to the event for longer than I can remember as a consumer and this year I will be a part of it as a blogger. This is one achievement that I honestly never expected but I am going to make the very best of it. For the other official bloggers, congrats on your being selected as well I know some great work is going to come out of this all around. The event starts April 1st and runs through the 30th so you have a whole entire month to check out all the goods that will be showcased to help you aid you in your creative blogging and photography. I have seen a lot of the designers that are apart of this and there are well known stores and there are some that you may not be familiar with and I hope to help bridge that as well. It’s once again that time for me to wrap this up and look towards the future (as now I have plenty to plan for). We’ll see what tomorrow brings and I hope that I can get those creative brain waves going on whatever and wherever I am lead to. If there’s anything you might have a question about feel free to contact me through social media which you can find the access to on the right sidebar of the page or in the about me section.